Hammer & Steel sells, rents, and services German made Müller H-Series and HFV-Series vibratory hammer equipment in North America. Müller, owned by ThyssenKrupp, has a proven track record for more than 50 years as a manufacturer of leading edge products. The reliable and durable vibratory hammers can be used for a wide range of applications. 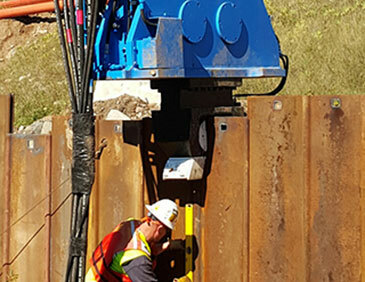 The largest units of this series are used for driving the heaviest sheet piles into dense, compact soils. 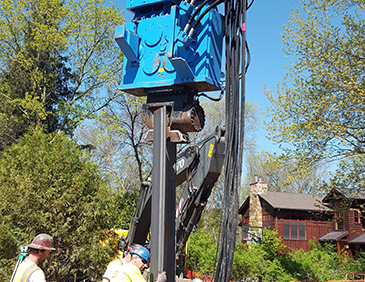 Our experienced staff will carefully analyze the details of your requirements and assist with selecting the appropriate equipment based on the soil conditions, pile weight, and driving depth.